May | 2012 | What Can I Say ? UPDATE: Sale is also taking place Sunday, May 6, from 10 to 5! I admire people who can do things with their hands, especially potters. Think of taking a heavy blob of wet clay and putting it on an electrically-driven (or foot-pedaled) spinning wheel; after awhile a dish emerges, or the beginnings of a sugar bowl, or a teapot. And they’re usually created in myriad textures and colors, with or without embellishments. Incredible what these people can create. Put ME in front of a potter’s wheel with a heavy lump of wet clay and suddenly Lucy and Ethel are in the room. 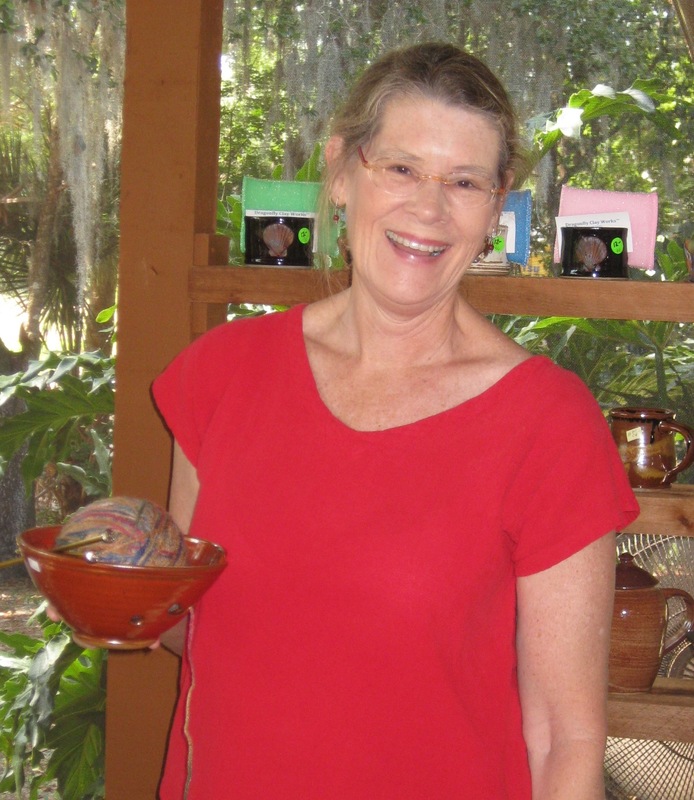 That’s Betsey Maupin above, displaying one of her yarn bowls at the Annual Spring Pottery Sale in Oviedo, which I visited today. Many knitters use balls of yarn which do not unwind neatly from the center of the ball; the yard lead is worked from the outside of the ball, causing no end of spinning and jumping and escaping if you’re not careful. Some balls of yarn have been known to travel great distances– remember that story about the woman in Danbury, Connecticut? Her ball of yarn got so far away from her that it took weeks before she found it– in Times Square! Yarn bowls keep the yarn unwinding in place, well away from Times Square, or your cat. 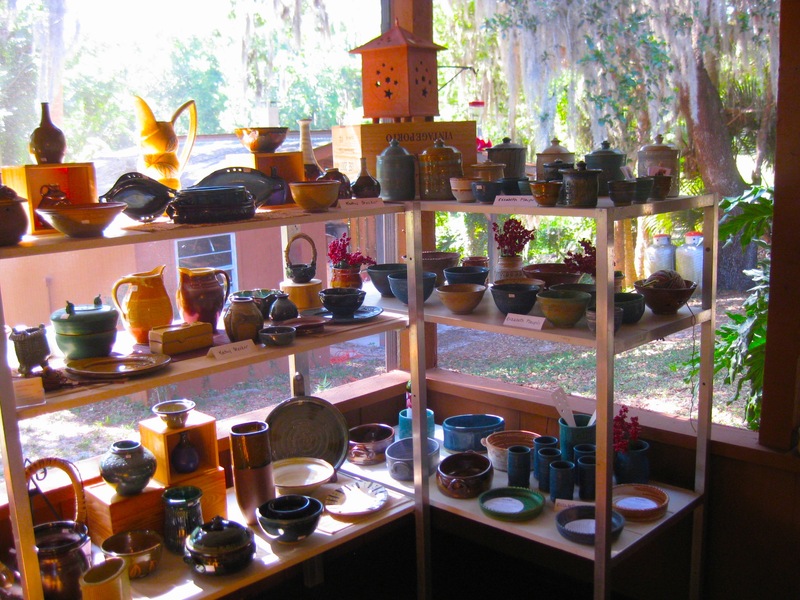 A talented group of potters gathered for this year’s sale, which goes on today (May 5th.) until 5 PM. It’s located at 356 North Central Avenue in downtown Oviedo– just follow the signs once you get to the block. 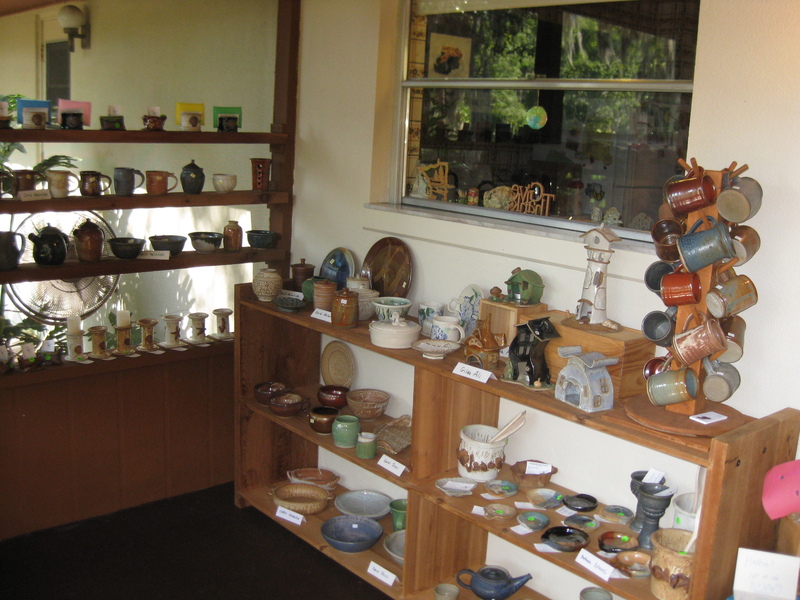 You’ll find mugs, mug trees, bowls of all shapes and sizes and hues, teapots that look like cottages, and a LOT of skill. If you get a chance today, drive on up to Oviedo and check out some excellent local artistry: kudos to Barbara Bailey, Susie Vey, Elizabeth Maupin, Carol Jones, Chris Heimlich, Barbara Estevez and Gilda Ali.